We’re 6 weeks away from the next MarTech conference in San Francisco. My anticipation is building — I’m eagerly drumming my fingers on my desk as I write this (much to the annoyance of the person sitting next to me). This will be the biggest and best one yet, and I wanted to give you a deeper preview of what to expect. If you haven’t registered yet, our “beta” rate discount — which is $350 off the on-site ticket price — expires this Saturday. If you like what you read here, please register this week to reserve your seat. So how will this be the biggest and the best MarTech yet? In previous years, I would describe the program agenda, then talk about the sponsors, and close by describing who the audience will be. I’m going to reverse that this time, because for all the wonderful things happening on the stage and in the exhibit hall, it’s the community who is converging at this next MarTech that, above all, will make this an incredibly special experience. 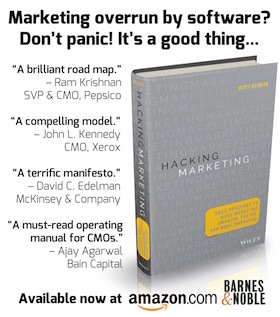 Marketing Technology Professionals of the World Unite! We’re expecting over 1,000 attendees at this next MarTech. Most are mid-to-senior level digital, marketing, and technology executives — including many marketing technologists and heads of marketing technology at major firms — paticipating from a wide range of industries. 3M, AB Electrolux, ADP, Aetna, Allianz, Apple, Bank of America, Capital One, CarMax, Charles Schwab, Cisco, Clorox, Creative Artists Agency, Constellation Brands, Dell, eBay, Edelman, E & J Gallo, Eli Lilly, Emerson, Gartner, General Mills, Genworth, Google, Facebook, Fidelity, Fisher Investments, Hallmark, Hewlett-Packard, Hilton, Infosys, INSEAD, Intuit, Investor’s Business Daily, Janus, John Hancock, Johnson Controls, John Wiley & Sons, Kimberly-Clark, Land O’Lakes, LexisNexis, Mars, Massachusetts Medical Society, McDonald’s, McGraw-Hill, McMillan, Microsoft, Motley Fool, Natixis, Nestle Purina, New York Times, Northwestern University, Orange, Pfizer, Planar Systems, Plantronics, Prudential, Questrade, REI, Scripps Health, Sephora, Shutterfly, Sony, Stanford GSB, TD Bank, TechData, Technicolor, Teradata, Time Warner Cable, Transamerica, USAA, Wharton School of Business, Xerox, Yamaha — and that’s only a small fraction of registrants so far. This is, by far, the most epic gathering of marketing technology professionals in the world to date — and the best opportunity to meet an incredible set of your peers. The conversations over a meal, or a drink, or just with the person sitting next to you can open new doors and new ideas. There’s still time to enter the Stackies up until March 11 — just make a 16×9 slide that shows how you visualize your company’s marketing technology stack and email it to sbrinker@chiefmartec.com before the deadline. See the 2016 Stackies announcement post last month for details. MEMO TO MARKETING TECH VENDORS: The Stackies are a great opportunity for you to share your own stack and show off how your product fits into the broader marketing technology ecosystem. At MarTech, there are absolutely no surreptitious pay-for-play options for vendors in the editorial program. But at the same time, it’s important to recognize that so many incredible innovations in marketing technology today are being forged by these companies. From bold, inventive start-ups to influential, strategic giants, firms across the marketing technology landscape are reimagining how software shapes the future of marketing. So I am thrilled that 100 marketing technology companies are exhibiting and sponsoring this upcoming MarTech. It’s a unique opportunity to meet many of the vendors that you’ve either worked with or considered working with in person — and to serendipitously discover new companies offering capabilities that you may have never even imagined. The thumbnail graphic of logos shown here offers a taste of the diverse ecosystem of marketing technology innovators who will be on site to meet and engage with you. You can view all MarTech sponsors and exhibitors and the floorplan layout for more details. Now, let’s talk about the editorial program. This year, we’re expanding to two tracks, doubling the number of sessions that we were able to schedule. From hundreds of terrific speaker proposals, we selected 8% — the best of the best — along with a select number of invited special guests for plenary sessions at the beginning and end of each day. Christopher Penn, VP Marketing Technology at SHIFT Communications and author the new book Leading Innovation will present Scaling Innovation: Addressing the Martech Balance Challenge — describing how to create a different kind of martech team whose focus is solely on scalability, and how innovation is transformed into products and services. Gerry Murray, Research Manager of the CMO Advisory at IDC, will present Cognitive Marketing: The Rise of the Super Intelligent Marketer — will illuminate the new capabilities that “cognitive services” now offer marketers, leveraging data and artificial intelligence. What was science-fiction is fast becoming marketing management reality. Rohit Prabhakar, Head of Digital Marketing Strategy and Marketing Technologies at McKesson, will present Marketing Technology to Enable Customer Obsession — a case study of how McKesson has combined marketing technology, people, and processes in the service of customer obsession through a center of excellence, carefully crafted martech infrastructure, and a strong culture of collaboration across the business. Joseph Puthussery, VP Digital Marketing & Operations at Cisco, will present A Balance Struck — Sales & Marketing Alignment — describing Cisco’s journey in leveraging marketing technology to better connect marketing and sales: developing a common language, designing modern automation and nurturing programs, implement process and culture for operational rigor, and governing fast-moving technology. Pat LaPointe, Chief Growth Officer at Growth Calculus and author of Marketing by the Dashboard Light, will present Bridging the Gap Between Marketing & Finance — will bring frameworks and stories from large brands to show how attribution and optimization can be transformative tools when used in a people-smart way, using data to build bridges vs. bunkers, and substantially improve the role of marketing as value-driver vs. cost center. Brad Rinklin, CMO at Akamai, will present Marketers Driving IT Purchasing — sharing his experience at Akamai in leading the direction of the company’s marketing technology capabilities and how the company is leveraging them to make agile decisions, create insightful content for its target audiences, and prove ROI. Ian du Mee, Senior Manager of Global Marketing Operations at LinkedIn, and Sidd Sengupta, Marketing Data Enablement at LinkedIn, will give a joint presentation Ready, Aim, Fire: LinkedIn’s Custom Targeting Suite — a behind-the-scenes look at how LinkedIn has deployed a suite of internally-built solutions for predictively targeting members at scale to support its diverse B2C and B2B product lines: a statistical modeling engine built on Hadoop, which allows marketers to predict campaign response behaviors; a self-serve data mart and boolean search engine enabling marketers to easily define their target audiences; and a campaign prioritization engine enabling marketing organizations to support governance of contact frequency and audience collision. Micah Fisher-Kirshner, Senior SEO Manager at Zendesk will present The Expanding Nature of SEO — revealing the state-of-the-art of SEO practices, encompassing a multitude of optimizations for Apps, Google Answers, Accelerated Mobile Pages, and scores of emerging technologies. Siri anyone? Beki Scarbrough, Vice President Integrated Marketing at CA Technologies, will present How Quickly Martech Turns Into War-Tech Among Teams — answering, most importantly, how to prevent siloed management disasters and political stakeholder nightmares when navigating the evolution of your marketing technology stack. Troy Steen, Manager of Analytics and E-commerce at Dell, will present One Profile To Serve Them All: How A Unified View Of The Customer Drives Martech Integration And Success — will describe how Dell created a customer acquisition engine to drive better omni-channel experiences through a foundational “data layer” and the ability to create and activate holistic, 360-degree profiles. Learn the strategy, best practices, and tools that Dell uses to delight customers, achieve its omni-channel goals, and stay ahead of the competition. Mark Roberts, CMO at ShoreTel, will present Using Martech And Data To Re-Imagine Channel Marketing — explaining his company’s experience in shifting ineffective MDF spend on golf tournament and t-shirt giveaways to more data-driven demand and customer acquisition programs; educating, onboarding and enabling channel partners at scale with new tools and capabilities; and simplifying and automating channel marketing’s outbound demand generation to acquire, score and nurture new leads in an innovative way for ROI. Isaac Wyatt, Director of Marketing Operations at New Relic, will present The DNA Of Unicorns And Marketing Technologists — profiling the martech stacks of “unicorn” companies (those valued at more than $1B) including: an analysis of their tech stacks using Datanyze data; cohorted company growth and its relationship to their technology choices; the order of adoption of key/critical martech stack technologies (CRM, MAP, adtech, etc. ); and advanced analytics techniques to assess probability of martech adoption at each major stage of company growth. Mayur Gupta, SVP and Head of Digital Platforms & Marketing Technology at HealthGrades (and founding MarTech advisory board member), will present The Omni-Channel Reality With Marketing Technology & Integrated Experience Planning — how to develop seamless omni-channel experiences through connected marketing technology machinery, along with data, content and an integrated experience planning process that is driven by consumer behaviors and not channels or touchpoints. Justin Sharaf, Director of Customer Marketing at LogMeIn, will present How Marketing Automation And CRM Integration Can Improve Sales And Marketing Collaboration — will share the experience of his company’s explosive growth and how marketing and sales operations collaborated to re-architect the way their marketing automation platform (Silverpop) and CRM platform (Salesforce) interacted, building an enterprise-grade system to monitor and manage sales and marketing activities and measure results against agreed-upon goals. Jaemi Bremner, Marketing Technology and Capability Leader at Intuit, and Patrick Spenner, Strategic Initiatives Leader at CEB, will jointly present A Herculean Story From Intuit’s Global Automation Rollout: Scaling The Soft Stuff To Unlock Technology Upside — the experience of a global marketing automation platform rollout at Intuit, with lessons of collaborative tools that keep marketing and IT moving in lockstep during the rollout and beyond; how to scale marketing contributors’ capabilities; organizational change management that goes hand-in-hand with technology and strategy; and how to account for varying levels of maturity and capability across country marketing teams to support a global martech launch. Travis Wright, Chief Marketing Technologist at CCP Global, a renown martech expert and stand-up comic, will present The Ultimate Guide To Building Your Martech Stack — a whirlwind tour of the types of components that you should consider in your marketing tech ecosystem, as well as a few options per tool category. You’ll be entertained and educated on the many nuances of building an effective martech stack. I will moderate a roundtable discussion on Agile Marketing: How To Really Make It Thrive with four agile marketing experts — Jascha Kaykas-Wolff, CMO at Mozilla; Barre Hardy, Associate Partner at CMG Partners; David Lesué, Creative Director at Workfront; and Roland Smart, VP of Social & Community Marketing at Oracle — to discuss: how to balance agile responsiveness with strategic planning and thinking; how to scale agile marketing beyond a single a team; how to blend more “lean” principles into your agile practices; how to interface with other departments and agencies while running agile sprints; how to develop an agile culture in a variety of different organizational environments; and tools for managing agile marketing — and interfacing to the rest of your marketing tech stack. Next, I’ll close the day with a one-on-one fireside chat with Monique Bonner, Global Marketing Vice President for Digital, Technology and Innovation at Dell to discuss Dell’s experiences in marketing transformation: balancing centralization and decentralization in marketing innovation; managing the evolution of marketing technology stacks on a global scale; powering better human connections through digital marketing touch points; nurturing marketing talent to take advantage of new digital capabilities; governing brand and security with marketing technology empowerment; breaking down silos between internal teams and external service partners;and identifying future trends in marketing’s evolution and staging their adoption. And all that? That was just day one. Ram Krishnan, SVP & Chief Marketing Officer at Frito-Lay North America, will kick off the day with a presentation on Frito-Lay’s D3 Convergence In Marketing: Design, Digital, and Demand — the company’s pioneering D3 Studios initiative that brings together a divergent set of contributors — designers, creative people, data scientists, and people who can actually code — to “make magic happen” across exciting new marketing programs and projects. David Edelman, Principal at McKinsey & Company and global co-leader of the firm’s digital and marketing & sales practices, will present The Journey Wins, Not The Tech — his experience in helping marketing executives at major brands around the world manage the strategy, organization, and infrastructure transformations required to become “digitally adroit” leaders, from creating digital centers of excellence, to developing marketing technology architecture plans, to redesigning entire go-to-market approaches. I’ll have a one-on-one fireside chat with Andrew Chen, one of the world’s most renown growth hackers who now leads Supply Growth at Uber, to discuss Andrew’s experience with growth hacking at many different companies; the patterns and frameworks he has developed through those experiences; and his latest work leading “supply” growth at Uber. This is a master class that you won’t want to miss. Sheldon Monteiro, CTO at SapientNitro, and Thom Langford, CISO at Publicis Groupe, will jointly present Level Up Your Martech Information Security Smarts In 8 Steps — addressing the security challenges that every marketing technology leader faces, but doesn’t always recognize, and will show the audience how to deliver great work quickly and safely, establish a level of confidence and trust in digital security and design and engineer security into your platforms and projects. John Hardy, Director of Marketing Sourcing at The Walt Disney Company, will present Secrets To Successfully Partnering With Marketing Technology Sourcing — how marketing technology providers can engage sourcing and procurement as an ally to navigate and advocate across large organizations. He’ll discuss how Disney deals with startups vs. established players; how to structure deals to increase the probability of adoption and success; the importance of the proof-of-concept; and how marketers should budget and decide on which tools to buy. Sylvain Masson, Director of Digital Transformation at Heineken USA, will present Demystifying Digital Transformation — describing how to find the right balance of setting an ambitious vision, while at the same time building the puzzle in small blocks — with a test-and-learn approach and openness to changes in direction — to ensure adoption at scale. Since digital transformation cannot be the job of one individual or one function, Sylvain will describe his experience and perspective on crafting cross-functional partnerships (marketing, IT, legal, HR, sales, etc.) to achieve the best outcomes. Tony Byrne, founder at Real Story Group, will present Mythbusters: 10 Myths Martech Vendors Tell (And What’s The Real Story) — what happens when excitement becomes hype and enterprise decision-makers create plans based on unproven tools or approaches? In this fast moving session, Tony will uncover 10 key myths that vendors espouse and offer the accompanying reality for each one. Come away with a clearer view of the marketplace and a more practical take on the opportunities in front of you. David Raab of Raab & Associates, one of the founding members of the MarTech advisory board, will present How Machine Intelligence Will Really Change Marketing — how machine intelligence is used throughout today’s marketing and advertising technology stacks; where machine intelligence will expand its role in the immediate future; how machine intelligence will change the job of marketers and what new tasks marketers will need to master; and what marketers can do today to start preparing for their future. Laura Patterson, President of VisionEdge Marketing, will present With Credibility Comes Influence And Relevance: How You Can Employ Performance Management To Achieve All Three — in 14 years of research involving hundreds of firms, analysts have consistently found that only one in five marketers earn an “A” from the C-suite for their ability to prove their value, impact and contribution. In this session you’ll learn: the six areas where these best-in-class marketers excel; how you can build and leverage your business acumen; and how to make your data, analytics, and metrics more relevant to the C-Suite. Shawn Goodin, Director of Marketing Technology at The Clorox Company, will present A Strategic Framework For Automated, Personalized, Cross-Channel Consumer Experiences — sharing his experience building a strategic framework to guide the way to automated personalized consumer experiences across multiple channels at Clorox. Toby Chaudhuri, VP of Communications for Station Services at PBS, and Adam Marchick, CEO at Kahuna, will jointly present From The White House To Your House: How PBS Is Reimagining Public Broadcasting With Marketing Technology — outlining the best practices in modern marketing strategy, community, design and mobile engagement through a case study of how PBS reimagined public broadcasting by engaging local leaders to develop and distribute programming through marketing technologies. Mary Dalton, Assistant Vice President and Content Strategist at Zurich North America, will present Taming Content Chaos: Solving The $958M Marketing Problem — sharing the five tactics that helped Zurich launch over 1,700 pieces of content and 137 campaigns in just six months, and the technology that helped her get there. From establishing workflow strategies to cross-departmental visibility and collaboration, you will learn how to establish an efficient marketing content production process. Dave Morgan, CEO of Simulmedia and an adtech pioneer, will present The Collision Between Adtech and MarTech — the imminent collision between martech and adtech and how the convergence between martech and adtech will reshape the industry. Ad tech built for the needs of media intermediaries is giving way to marketing tech built to serve marketers and their customers.Old-style media metrics like GRP’s, CPM’s and impressions are going away, as marketers focus more and more on business outcomes and ROI. Integration with the enterprise will matter much more in advertising’s future than ad agency relationships. Cristian Citu, Director of Global Digital Marketing at DHL, will present The Logistics Of Global Digital Marketing In Logistics — providing insights on how digital marketing is being approached within the world’s largest logistics group, from the digital KPIs, the practices for working with and managing digital partners, to the hunt for new digital revenue streams and more. In a Vendor Roundtable on the Future of Marketing Tech, Scott will moderate a debate with several of the industry’s leading vendor visionaries — Steve Krause, Group Vice President of Product Management at Oracle; Adam Blitzer, SVP & GM of Salesforce Pardot; and Chandar Pattabhiram, Group Vice President of Product & Corporate Marketing at Marketo — on what they see for the future of marketing technology space over the next 12-24 months. Topics to be discussed will include: the balance between consolidation and diversified innovation; the challenges and opportunities for marketing platforms and ISVs; the next wave of evolution in marketing and IT collaboration; the blurring of lines between sales/commerce and marketing; new disruptive technologies (IoT?) that will reshape marketing; and how marketers can prepare for a continuously changing future. Finally, in the closing Venture Capital Roundtable On The Future Of MarTech, Scott will lead a discussion with top marketing tech VCs — Stacey Bishop, General Partner at Scale Venture Partners; Ashu Garg, General Partner at Foundation Capital; and Kobie Fuller, Investor at Accel Partners — on the future of marketing platforms — new disruptors to Big Martech; the “unicorn” phenomenon and its effects on marketing technology; the dynamics of private capital, M&A, and IPOs in marketing tech; how to place bets on who the winners will be in emerging technologies; promising categories for new marketing technology companies; and disruptive new technologies beyond martech that will impact marketing. Whew. That’s two intense days of marketing technology. 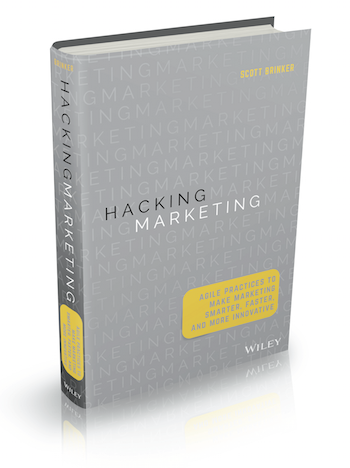 I actually forgot one session: the opening keynote, which I will be delivering this year, covering key themes of my new book, Hacking Marketing, on managing the wild and wonderful entanglement of marketing and software. Every paid full-access conference attendee will receive a complimentary copy of the book, and I’ll be doing book signings at the opening reception on Sunday evening and during the networking reception on Monday evening. There’s also a very likely possibility that we will be giving out free posters of the upcoming 2016 marketing technology landscape — assuming I can get it done in time to be printed (no pressure!). See? I promise this will be the biggest and best MarTech yet — I hope you join us!